Like many small towns in the Finger Lakes, Auburn pulls out the stops when it comes to Holiday decorations. Downtown is ablaze with colorful lights. Drive through any neighborhood and it seems like there is a competition going on. Lights are draped over the trees, bows and wreaths are on front doors and candles flicker in windows. The Finger Lakes holiday season kicks off in Auburn on the Saturday after Thanksgiving with a parade through Downtown hosted by the BID/Business Improvement District. From 3 – 6 pm, there will be all sorts of kid and family friendly free adventures along with horse drawn wagons rides. At 6 pm as the Parade winds through Downtown, Santa will arrive for the Tree Lighting at City Hall. Lydia and I carry on a tradition my mother started for me when I was four years old. We ventured off to G. Fox and Co in downtown Hartford to see Santa and to selected one – only one – tree decoration. It was a tough choice, let me tell you. These very special keepsakes are now hung on my own tree each year. Today, she and I trundle off to Dickman Farms, Archie Street, to handpick our own special ornament. And the selection is fabulous! The entire expansive green house is a true inspiration. Poinsettias and other seasonal plants; trees and with that great assortment of ornaments ranging from whimsical to traditional; and wreaths and garlands; narcissi and amaryllis bulbs to force are all there. Check out their website for special events and workshops throughout the year. There is a new event for 2013 in the Finger Lakes. 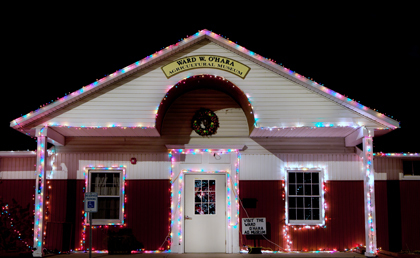 The Ward W. O’Hara Agricultural & Country Living Museum and the Dr. Joseph F. Karpinski Sr. Educational Center will be hosting a “Festival of Trees: A Community Celebration” from December 1 - 23, 2013. A display of over 30 trees created and decorated by local businesses, community groups and artists. Big trees. Little trees. Old-fashioned and modern. There will be something for everyone. Located across from Emerson Park on East Lake Road, Auburn, the facility will be open weekends from 11am – 8 pm and weekdays from 4 – 8 pm. There is no admission and parking is free. The exhibition space is not heated so dress warmly. The Educational Center is heated. And last, a very special gift to the entire community from one family. The Atkins family of 6998 Owasco Road has been hosting a Christmas Light Spectacular for almost 10 years. Beginning on Thanksgiving Eve and running until Christmas Day, there are over 80,000 Computer Controlled LED lights all synchronized to music and broadcast to your car radio on 89.5FM in an outstanding light show. Be careful as you pull over to the side of the road and follow all directions for your safety. We stop by at least twice during the Christmas Season and always take visiting friends and relatives as there is so much to see and enjoy the show. December 8 is the traditional museums Holiday Open House, a 35 year tradition. You cannot possibly visit all the stops to enjoy the music; homemade cookies and treats; special exhibitions, All stops are open for free and include Willard Memorial Chapel, Schweinfurth Art Center Cayuga Museum, Seward House Museum, Harriet Tubman Home, Award O’Hara Agricultural Museum plus St. Francis Church which will host the Auburn Chamber Orchestra at 4 pm; St. Marty’s Church and Westminster Presbyterian Church which will host quartets from Auburn High and Masterwork’s Chorale. Come celebrate the spirit of Christmas in the Finger Lakes.